As Polish Lot flight number 136 descended into Warsaw, I stared out in disbelief at the 6 inches of snow on the ground! This was Easter Sunday, March 31. It should NOT be snowing, I thought. 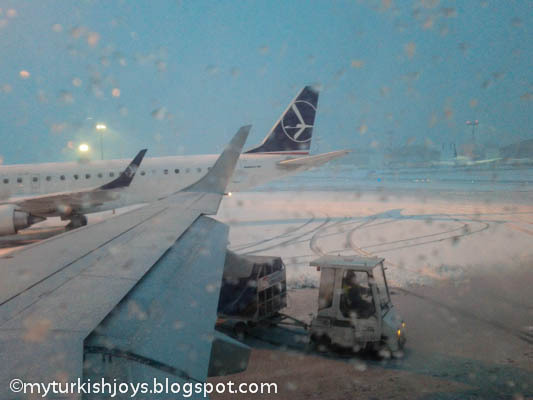 This is what it looked outside my window as we first landed in Warsaw on March 31, 2013. We had just left (my heart) in Istanbul where we had a gorgeous weekend frolicking among the lale at Emirgan Korusu and walking along the Bosphorus. We said farewell to dear friends and enjoyed a totally Turkish sendoff at a boisterous meyhane in Taksim. Now, the Whirling Dervish-swirling snow seemed like a cruel joke. Welcome to my new expat life in Warsaw! I already felt devastated about leaving Istanbul, and the snow only added to my mounting depression. I turned to my husband, mockingly, but half seriously, told him I was leaving him. I was getting on the next plane and returning to my beloved Istanbul. In reality, I stayed. I still love my husband, and it wasn’t his fault – really! Our moving choices were either Warsaw or return to a “normal” life back in NYC. We would prefer to stay abroad as long as we can, so the choice was a so called easy one. Our first day in Warsaw was Easter Monday, so nearly every store was closed, even Starbucks. We briefly ventured out in the blustery snow to find food and coffee at a local coffeeshop. At least, a caffè latte is the same in every language. 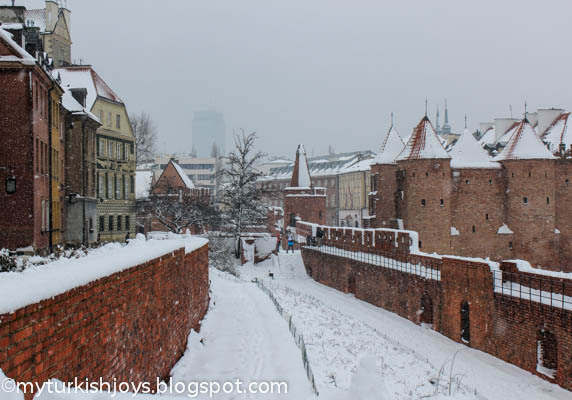 Looking back, now the snow looks kinda pretty as seen here in the Old Town of Warsaw. At some point, I shed a few tears. I was depressed and still a little angry at my husband. Later on, I thought about the older expat ladies I know back in Istanbul. I wonder what made them give up everything they knew as familiar in the U.S. and move to Turkey some 40 and even 50 years ago. 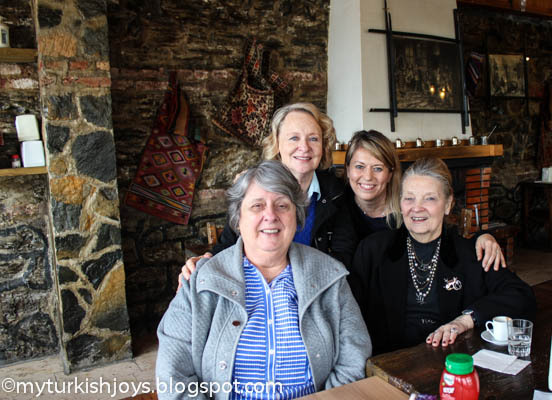 Now, that was an amazing feat for these pioneering ladies who loved to tell me about bringing back their own toilet paper from the U.S.
My older girlfriends, Connie, Elaine and Charlotte, in Istanbul have shared many stories about moving to Istanbul in the 1960s and '70s. I cried the next two days as well. I slept in as late, swaddled in the down comforter, as I could in our hotel room at Hotel Bristol. I figured the longer I slept, the less time I would have awake to face my new reality in Warsaw. By day four, I only let a few tears slip and mass messaged friends through Facebook and e-mail. I told myself to buck up and make the best of it. I ventured out again in the snow and discovered a piece of American familiarity at Brooklyn Burgers & Wings on the main street. 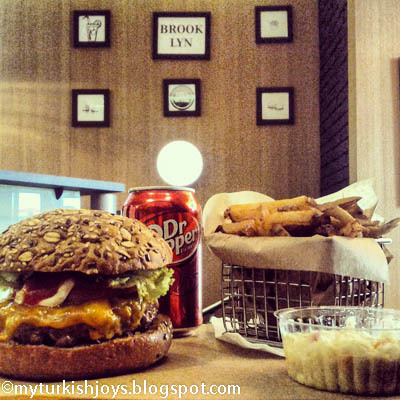 It’s probably no surprise that this burger joint is owned by an American expat. My familiar American burger found in Warsaw as seen from my Instagram account @mytravelingjoys. On day seven in Warsaw, I boarded a plane again. I was heading back to the U.S. for two weeks to see family and friends and attend a wedding. I couldn’t wait to be “home” and be in a place where I could be understood. 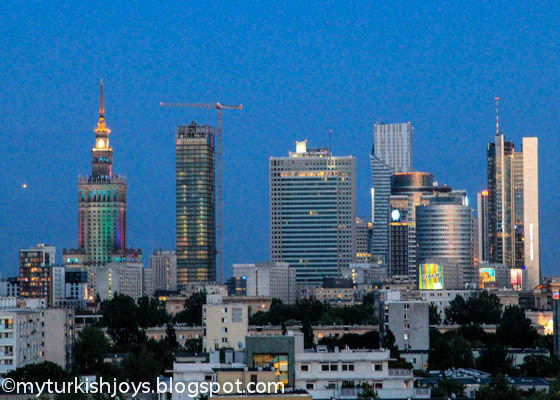 Fast forward – we’ve now been living in Warsaw for seven weeks. There are no more tears or snow. We’ve settled into a comfy apartment with a fabulous terrace at a fraction of the cost we would have paid in Istanbul. I’ve planted a bunch of herbs and flowers outside, and I’m back in the kitchen cooking homemade dinners and even mini rhubarb-strawberry pies. There’s tons of green space, and we can rent bikes and explore the numerous trails. Zoomed in view from our new terrace at dusk in Warsaw. I still miss my friends, but I’m starting to get out there and make new ones. That’s what expat life is all about. Yep, I think it’s going to be a good day or a good time here in Warsaw too. hi joy! it is always so difficult to leave places we really enjoy. these moves never seem to come at the right time! i am sure you will be out scurrying around the streets of warsaw and meeting new people in no time at all! what an exciting adventure! . . an authentic meyhane in Warsaw - now there's a thought and a reason to be cheerful! So glad you have a lovely apartment with a terrace garden. I am sure you are familiar with bialys from NYC; in Poland, they are superlative. Keep you eye out for mazurka too (pastry) and my beloved kielbasa. You will also encounter smalec (phonetic: smaletz) -it is rendered lard with bacon and onion cracklings. Extremely artery clogging, but worth a taste on a bit of good bread. Oh, the wonderful food you will eat - I need to get back to Poland, but must visit eastern and Black Sea Turkey first. @Joyce, thanks for the encouraging words! @Ilke, very true! I left a piece of my heart in NYC and Baltimore too! @Mary B, so am I! We finally have a little bit of green space in the big city. Yay! Thanks for more tips! We've tried the lard at a bar here - very tasty. My father-in-law can't wait to try it! @Claudia, thanks dear! You know you and T are welcome to come visit us! We do have a guest room. ;-) Yes, Warsaw is a big mix of historical restored buildings, ugly Communist cement blocks and modern sky rises.